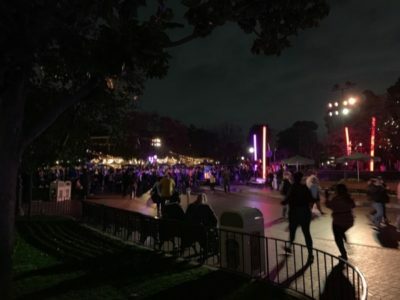 Disneyland After Dark is becoming a popular activity for regular visitors to Disneyland Resort Parks. What is Disneyland After Dark? Is it a smart choice for you and your family? 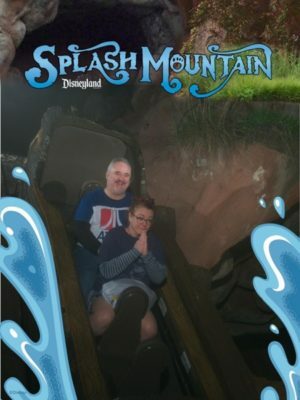 What happens during Disneyland After Dark? 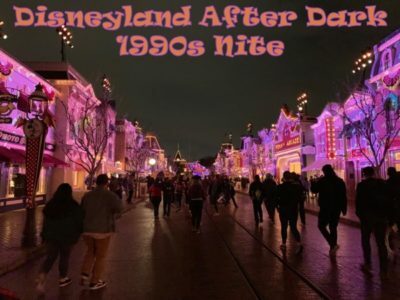 I attended the Disneyland 1990s Disneyland After Dark in March 2019. Here are my thoughts on the night. It was a decade of incredible activity for Disney. Our small screens were filled with some of the most beloved Disney characters meeting us after school (or work). Large posters billed crossovers with these TV characters and the large screen. We also met the witches from Hocus Pocus and entered The Tower of Terror; followed animals Homeward Bound, with White Fang and Iron Will. We watched That Darn Cat and delved into A Bug’s Life. It was a time of Flubber, Air Bud, Angels in the Outfield, and Mighty Ducks. We found out that Jamaica has a bobsled team and newsboys can change the world. And, if you were very lucky, you would have attended the premier of George of the Jungle at the San Diego Wild Animal Park. This was also the ten years of some of the most beloved Disney animation of all time: Beauty and the Beast, Aladdin, The Nightmare Before Christmas, The Lion King, Toy Story, Pocahontas, A Goofy Movie, The Hunchback of Notre Dame, James and the Giant Peach, Hercules, Mulan, Fantasia 2000, and Tarzan. What’s not to love about the 1990s? I was planning my trip to Disneyland Resort when Disney Parks announced the February and March After Dark parties. I was so excited that the March event fell within my dates and was 1990s themed that I immediately contacted my Magic For Less Travel Agent and ask her to purchase tickets. 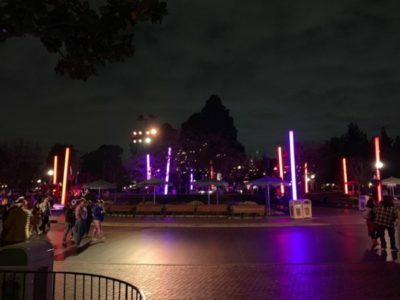 Each Disneyland After Dark party offers similar but unique inclusions for a single cost. Tickets are $100+ per person ages 3 and above. This is a steep cost for the number of hours of the party (often 4 hours). The tickets are valid for the mixer—3 hours before the party’s start. So, you are paying for seven hours in the park. That’s right, the single park of the party. Your ticket does not include parking. What is included? 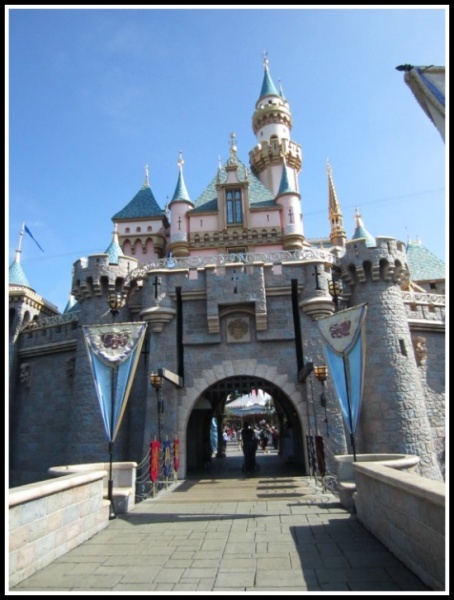 If you pop your ticket into your Disney App, your PhotoPass pictures are available for download for 45 days. You have party exclusive use of the park for four hours. 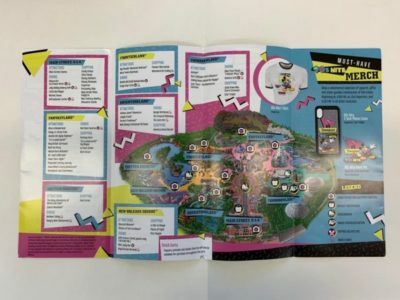 There is a set of party swag including a special map. The parties all utilize special backdrops, props, and meet-and-greets. There are dance parties and, often, spectaculars. They encourage adults to cosplay. If you think about a low key Halloween and Christmas Party, then you have the offers for the After Dark parties. There are two options for getting your wristband for the party. The first is to be in the park during the day. You will need to have either an Annual Pass or a day ticket for this method. When the mix-in begins, head to the in-park check-in. For my night this was at the Starcade. Here, several lovely Cast Members will check your tickets (you must bring the hard copy of your tickets with you for check-in). You will need to line up but the lines go quickly. Once at the front, they scan your ticket and they fit you with your wristband for the night (left arm, make sure that your clothing, costume, and jewelery will allow this). They give you your special event swag at this point. 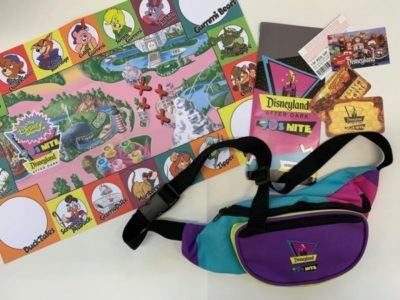 On our night we got a nifty 1990s inspired waist bag and a special map. Annual Passholders had the option to exit through a different line so they could received a special button. The second is to line up outside at the gates marked for the event. There are many Cast Members around to answer your questions and make this process easy. Obviously, this method does not require you to hold a ticket of any sort other than the event ticket. Once the 3-hour mix-in starts, the gates will open, and you will be ushered through. On the other side of the gate, they will fit you for your wristband (see above) and give you your event swag. Then you can enter the park. Mix-in is a good time to plan your night. With only 4 hours, you really cannot do it all. The map is your best tool. Here you will find where the special meet-and-greets will be, what food is being offered where (including the special event options), where special merchandise can be purchased and what is on offer. Dance parties, night-time spectaculars, scavenger hunts, photo ops, and in-park event games are all listed. Take a few minutes to read this guide. Pick out what is the most important to you. 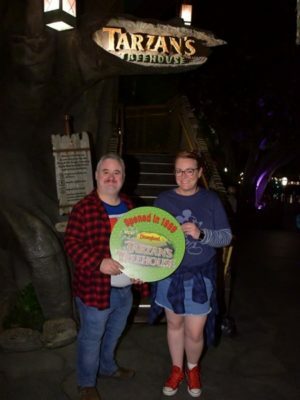 For my family, the most important thing was the Indiana Jones Adventure. 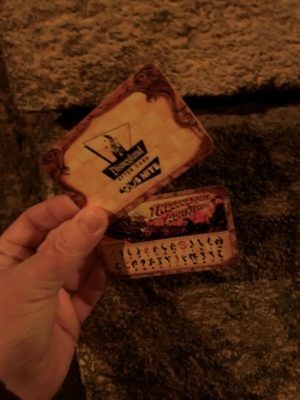 Within the cue, this special event was offering the decoder cards that were available when the ride first opened. I still have my original one from opening day, but my daughter is far too young to have one of these gems of her own. Getting one was paramount. None of the specialty food items really rocked our boat, so we also ate dinner during the mix in. This would give us the 4 hours for riding as many attractions as we could. Hey, we live in Australia. Going home to Disneyland is a once every two years opportunity. Lines for the event activity reign supreme. The meet-and-greets for special characters can be an hour or more. This goes for event merchandise and event food. However, the lines for most of the attractions were walk-on. We encountered 0 to 5-minutes waits for most… except Peter Pan. As usual, the line for this low capacity attraction was longer than most. We waited 25 minutes. All the event activities were swinging. When it was convenient, then I watched from the sideline or joined in. This would depend on your expectations, the makeup of your family, and the weather. I loved my experience. The night met my expectations. I achieved what I wanted and had limited waits. For me and my husband it was value for money, and we would look at doing it again. These complaints are fair enough. The lines for the event activities are long. You need to manage the expectation to ‘do it all’. I would agree that the event is not appropriate for those who cannot enjoy the 1am ending to the night. While we were at the event it rained, a lot. Prepare for the weather. 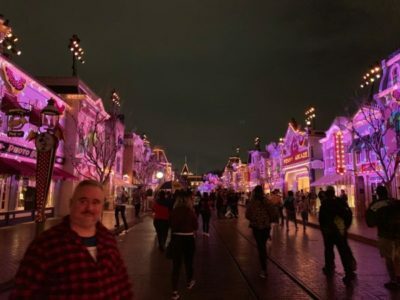 I loved my time spent in Disneyland After Dark. If I happen to be at the parks when another After Dark experience is happening, then I will endeavor to get tickets. And one more note, be prepared for the departing gift. Some events offer keepsakes at the end. For our event, it was a retro 1990s poster of Captain Marvel. For those interested, the next Disneyland After Dark is Marvel Heroes themed, so buy your tickets now! 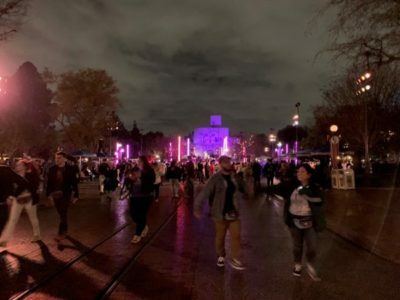 Did you attend the Disneyland After Dark event? What were your thoughts and what tips would you share? Let us know in the comments below or on Facebook or Twitter!